Oftentimes, in our modern world, I encounter Christians, even Catholics, who claim them are "spiritual, but not religious." These Christians even claim that Jesus came to end all religion and set up (false) dichotomies between loving Jesus ("being spiritual") and religion. We might, in lieu of this, take a moment and ask, what is "religion" in the first place? I can think of no better person to consult than St. Thomas Aquinas, the Supreme Doctor of the Catholic Church, who lived in the Middle Ages, i.e. the top teacher of the most "religious" strain of Christianity, in the most "religious" age of Western Civilization. 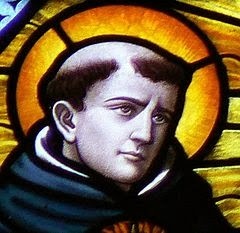 Aquinas, then, is a perfect representative, as will almost invariably be admitted by the anti-religion crowd, of "religion." I answer that, as Isidore says (Etym. x), "according to Cicero, a man is said to be religious from 'religio,' because he often ponders over, and, as it were, reads again [relegit], the things which pertain to the worship of God," so that religion would seem to take its name from reading over those things which belong to Divine worship because we ought frequently to ponder over such things in our hearts, according to Proverbs 3:6, "In all thy ways think on Him." According to Augustine (De Civ. Dei x, 3) it may also take its name from the fact that "we ought to seek God again, whom we had lost by our neglect" [St. Augustine plays on the words 'reeligere,' i.e. to choose over again, and 'negligere,' to neglect or despise.]. Or again, religion may be derived from "religare" [to bind together], wherefore Augustine says (De Vera Relig. 55): "May religion bind us to the one Almighty God." However, whether religion take its name from frequent reading, or from a repeated choice of what has been lost through negligence, or from being a bond, it denotes properly a relation to God. For it is He to Whom we ought to be bound as to our unfailing principle; to Whom also our choice should be resolutely directed as to our last end; and Whom we lose when we neglect Him by sin, and should recover by believing in Him and confessing our faith. 1. Religion means "to read the Bible again (and again)." In his first etymological definition, St. Thomas quotes St. Isidore (560-636), who quotes Cicero (107-44 BC), as defining "religion" as coming from the Latin "religio," from "relegit," meaning "to read again." St. Thomas sees "religion," in this sense, as meaning "to read again" the Sacred Scriptures and quotes Proverbs 3:6 to back up his point. More than just reading, however, St. Thomas also says that "religion" includes, importantly for a most illiterate age, frequently pondering the Holy Writings in the hearts of believers. Thus, "religion" is made up of frequent reading of the Bible and frequent calling to mind the contents read therein. 2. Religion means "to choose God again (and again)." In his second definition, St. Thomas looks back to St. Augustine (354-430) who, in his City of God, said "religion" comes from the Latin "reeligere" meaning "to choose again," specifically to choose God again. Here someone is "religious" when they continue to choose God in their lives over and over, rather than choosing sin, the flesh, or the world. The "man of religion" then is the man who lives not for the world or by sin, but is rather the man who lived for God. 3. Religion means "a bond with God." In his last definition, St. Thomas again look to St. Augustine but this time to his On True Religion, wherein Augustine explores the possibility that "religion" comes from the Latin religare meaning "to bind together." In this context, "religion" is that which "binds" man to God and God to man. Religion, then, is what makes "a personal relationship with Jesus Christ" possible. It is the man of religion who is "bonded to" God. In any case, no matter which definition of religion we use, I find it hard to see how any Christian could possibly oppose it. What, I'll ask, about religion is so worthy of condemnation? Does the Evangelical Protestant oppose reading, and re-reading, the Bible? If so, they can hardly continue to claim to be "Bible Christians." Does the Evangelical Protestant oppose "choosing God (again and again)" over a life of sin? If so, he fails to heed the repeated teachings of Jesus in the Gospels. Does the Evangelical Protestant oppose being "bonded with God," i.e. having "a personal relationship" with God? If so, he is rejecting the most fundamental plank of his theology. Therefore, I think it is rather safe to conclude that all Christians ought to strive to be "religious" and that Jesus came not to "end religion," but to make it more effectuous, more powerful, and more essential. 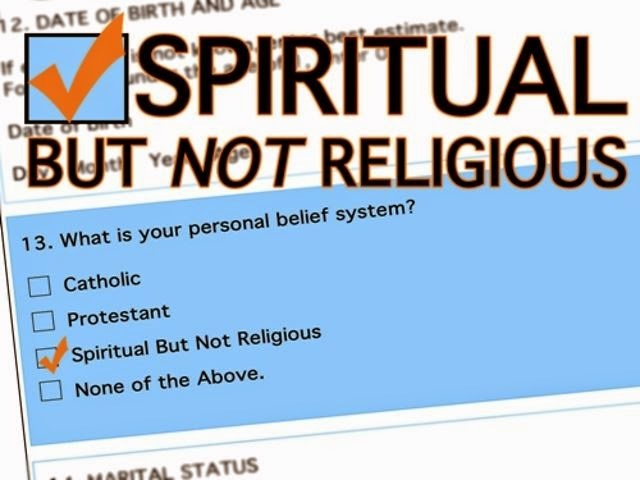 The next time you meet someone claiming to be "spiritual, not religious," take a second to explain what "religion" actually is and see if they still object. If so, at least you have something to actually debate over, instead of "cliché thinking."